It is becoming a trend. For the fourth time in as many games, Florida Gators basketball fell apart in the final minutes of a crucial game. And for the third time in the last four games, it resulted in a loss. Florida (9-7, 1-3 SEC) fell to the No. 24 Mississippi State Bulldogs (13-3, 1-2 SEC) on Tuesday night in Starkville, Mississippi, despite holding a late lead on the road against another talented team. The Gators once again saw their offense fail to execute and their defense implode over the final few minutes of the game as the heat has begun to be ratcheted up further on head coach Mike White following the 71-68 loss. Let’s take a look at what went down in Florida’s latest defeat. It was over when … senior guard Kevaughn Allen missed a running three-pointer at the buzzer. That’s just technically when the game ended, though it was actually over seconds earlier when the Gators allowed the hosts to break a 68-68 tie by driving the length of the court to hit a layup in a span of 6 seconds. Senior center Kevarrius Hayes attempted to step into the lane and take a charge, but he never raised his hands, only hit the driver with the side of his body and was inside the circle anyway. Mississippi State hit the ensuing free throw on the blocking foul to take a 71-68 lead with four seconds to play. That sequence was simply the conclusion off a disastrous end-of-game situation for Florida. Despite struggling at the end of the first half, the Gators used a 17-4 stretch spanning halftime to go up 43-38. Mississippi State answered with a 7-0 run as Florida missed six straight field goals to tie the game with 12 minutes to play, and it remained close from there. A 2:46 scoring drought really hurt UF, but it actually led 66-61 with 2:56 to play following a trey by Allen. MSU scored on consecutive possessions to tie it at 66 with 1:25 to play, and that is where everything fell apart for the visitors. 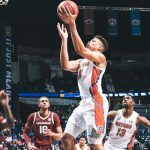 Florida used the entire shot clock on its next possession in an attempt to get a two-for-one to end the game but was not able to penetrate the lane; with time running out, freshman point guard Andrew Nembhard — one of the team’s worst shooters from downtown — jacked a three that had no chance of landing. Mississippi State responded with a jumper to go up 68-66. Taking over down two with 24 seconds to play, Nembhard tossed another unconscionable triple just 7 seconds later that was so ill-conceived it got blocked. Though the Bulldogs grabbed the loose ball, Gators freshman G Noah Locke stayed aggressive, stole the ball and made a quick layup to tie the game at 68. And you know what happened after that. Exceptional efforts: Allen, who posted a team-high 17 points on a decent shooting night (5/12 FG, 3/7 3PT, 4/4 FT), did not turn the ball over on the evening and added three assists. His last shot came with exactly 2 minutes left, and he never touched the ball again on offense. Freshman forward Keytonae Johnson was solid as well with 11 points on 3-of-4 shooting from beyond the arc. Back & forth all night but we fell on the road to @HailStateMBK. What it means: This team is a mess. The loss to South Carolina, near-loss to Arkansas (after blowing most of a 16-point lead) and loss to Mississippi State are the issues, not the defeat by No. 3 Tennessee — truly one of the best teams in the nation — on Saturday. 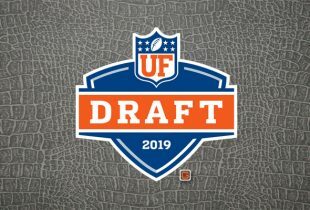 The Gators are not disciplined enough to make the correct decisions down the stretch and not talented enough to make up for those miscues when they do occur. Locke’s heads-up steal and hoop saved the game but only for a number of seconds until Florida blew the tie with lackluster defense despite that being exceptionally strong on that end of the court. White is facing some obstacles, namely his best player in Hudson being completely worthless so far this season. Still, 16 games in, UF should be playing better. The Gators clearly have some talented freshmen on the court — they are the best players right now — and a fantastic class coming in … but we still have six-plus weeks left of the 2018-19 season. 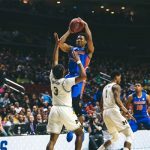 Despite Florida’s poor record entering the game, many bracketologists had it on the cusp of the NCAA Tournament considering its quality losses and solid defense. 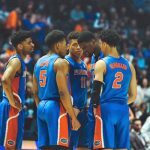 Even KenPom.com had the Gators ranked among his top 25 teams entering the game. Another loss and a record barely above .500 at this point should have everyone reconsidering. Up next: Florida will remain on the road when it heads to Georgia on Saturday at noon in a game that will air live nationally on CBS.